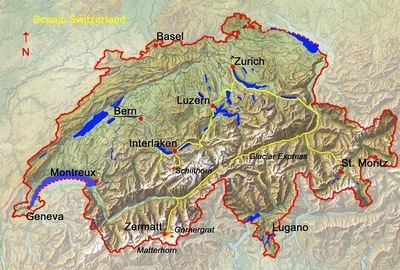 The following 11 vacation packages are offered through our partner in the Interlaken - Jungfrau Region specializing in Switzerland Tours which include scenic trains and attractive mountain excursions such as the ride to the Jungfraujoch - Top of Europe, at 3,454 m (11,330 ft) the highest railway station in Europe. You can request these pre-arranged tours as offered, but also ask for options such as additional nights or further (mountain)-excursions and stop-overs at any of the popular Swiss mountain resorts and/or cities. This is an ideal tour package for people who have only little time at hand and still want to experience the Swiss mountains in all their Grandeur. You stay either in Grindelwald, or at the Hotel Bellevue des Alpes, a 19th century “Belle Epoque” style Hotel at the Kleine Scheidegg, situated above Grindelwald and Lauterbrunnen at an altitude of 2,064 meters (6,770 ft) at the foot of the famous Eiger North Face. This tour shows you Switzerland at its best: historic cities and great landscapes! On your way from Zurich in the Swiss German part to Geneva in the Swiss French part (or vice versa), via Lucerne and Interlaken in the heart of the Swiss Alps, you get to see crystal-clear blue lakes and glacier covered peaks. This tour combines two of the best mountain excursions of the Alps! Stay in Grindelwald, the lovely mountain resort at the foot of the Eiger peak in the Bernese Oberland and enjoy the scenic ride to the Jungfraujoch - Top of Europe; and then, you stay in Zermatt, located at the foot of the world-famous Matterhorn; from there, the Gornergrat Cogwheel Railway takes you up to 3,089 m (10,132 ft) asl offering the best views of the Matterhorn. This tour connects 3 famous Swiss destinations and 3 fantastic mountain excursions. 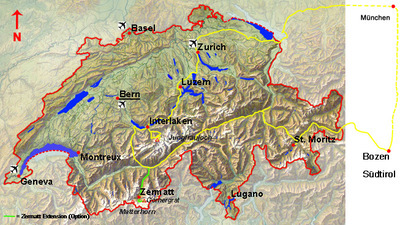 A perfect landscape experience that takes you to popular towns and villages and to the highest peaks of the Swiss Alps. 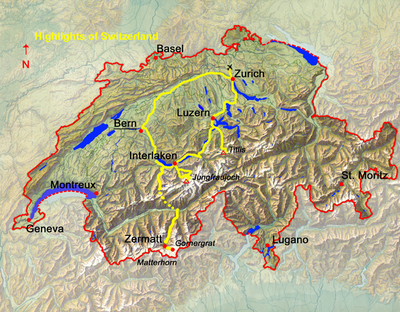 Travel scenic routes to the highlights of Switzerland: from the medieval town of Lucerne with the famous Chapel Bridge by panorama train to Interlaken, the gateway to the three spectacular mountains Eiger, Mönch and Jungfrau, and then to the car-free village of Zermatt at the foot of the word-famous Matterhorn. This tour shows you a choice of the most beautiful panorama mountains of Switzerland: from Mürren in the Bernese Oberland you visit the famous Schilthorn with ist Piz Gloria revolving restaurant where James Bonds "on her Majestys secret service" was filmed; and from Zermatt, one of Switzerlands most popular destinations, the Gornergrat mountain railway takes you up to 3,089 m (10,132 ft) asl. 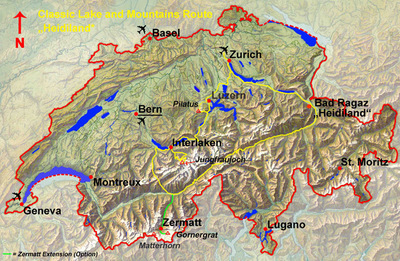 where you enjoy the best view of the Matterhorn as well as the highest mountains and glaciers of the Alps. This tour combines several highlights of every visit to Switzerland: the famous Glacier Express and also the Golden Pass train provide for scenic rides through great landscapes; the Jungfraujoch and the Mt. Pilatus allow for spectacular views of the whole country. 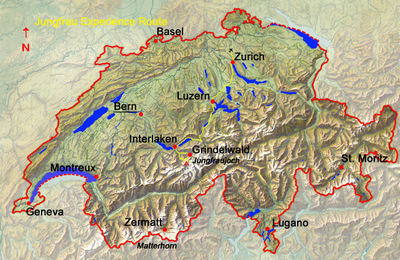 In addition, this tour includes a stop-over at the spa-resort of Bad Ragaz where, as legend has it, Heidi used to live. Consider adding a stop-over in Zermatt, the well known mountain resort, and/or in Montreux, the popular resort town on Lake Geneva. 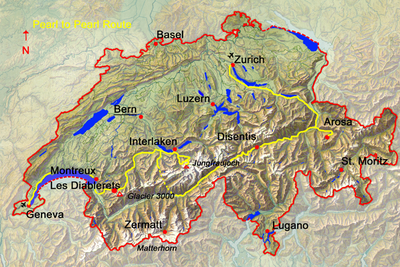 This tour connects some Alpine pearls of Switzerland! Experience scenic rides on the popular Glacier Express and Golden Pass trains traveling from east to west (or vice versa) along the northern side of the Swiss Alps, and enjoy fantastic views from the top of Mt. Schynige Platte or the Glacier 3000 including the spectacular Peak Walk. This tour is the ultimate round trip ! It combines the famous Glacier Express scenic train, St. Moritz, the glittering mountain resort, Zermatt with the Matterhorn, and Interlaken with the Schilthorn, the James Bond mountain. Take the slowest express train through the heart of Switzerland, and while having lunch in the panorama car you can inhale the magnificent scenery of the spectacular Swiss Alps. Follow the route of Thomas Cook and stay at historic Swiss "Belle Epoque" Hotels ! 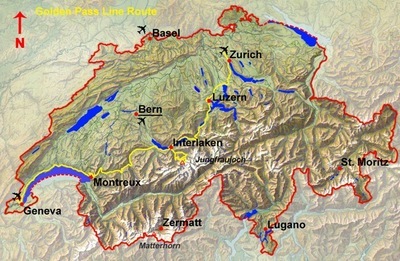 This tour by train, boat and on foot (optional) almost exactly matches the first guided tour in the Swiss Alps. 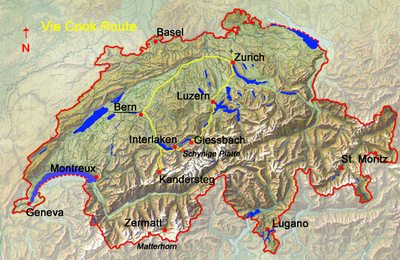 In 1863, after improvements of the roads, railway lines as well as steamboat connections had been made, Thomas Cook brought a group of British tourists to discover the heart of Switzerland, and as a result of this pioneering journey, the Swiss mountain resorts have become popular tourist destinations. This tour is a dream route linking 3 countries ! 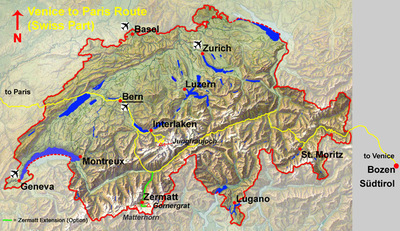 From Venice in Italy to Paris in France via Switzerland along the Swiss National Park, St. Moritz and Interlaken.The route is lined by 10 UNESCO World Heritage sites, and includes the famous Glacier Express scenic train and the mountain excursion to the Jungfraujoch - Top of Europe. * - The Heart of the Alps Tour allows for various options with regard to the starting point as well as the finish of your journey: transfers by 1st class highspeed trains are included in the package Price - from/to within Switzerland or cities in neighboring countries (e.g. from/to Paris, France; from/to Munich, Germany; or from/to Venice, Italy). A unique cultural and panoramic tour by scenic trains and yellow Swiss postal bus. This tour links several UNESCO World Heritage Sites such as the Dolomites Peaks in Italy, the Benedictine Convent of St John at Müstair, the Albula & Bernina railway lines and landscapes, the Swiss Alps at the Jungfraujoch with Aletsch Glacier, and Bern, the Swiss Capital.